The number of new foreign national inmates in 2009 was 1,392 (down 7.3% from the previous year) (Source: Annual Report of Statistics on Correction). Foreign national inmates that require different treatment from Japanese are categorized as Class F inmates and treated according to the culture and customs, etc. of their home countries. Fig. 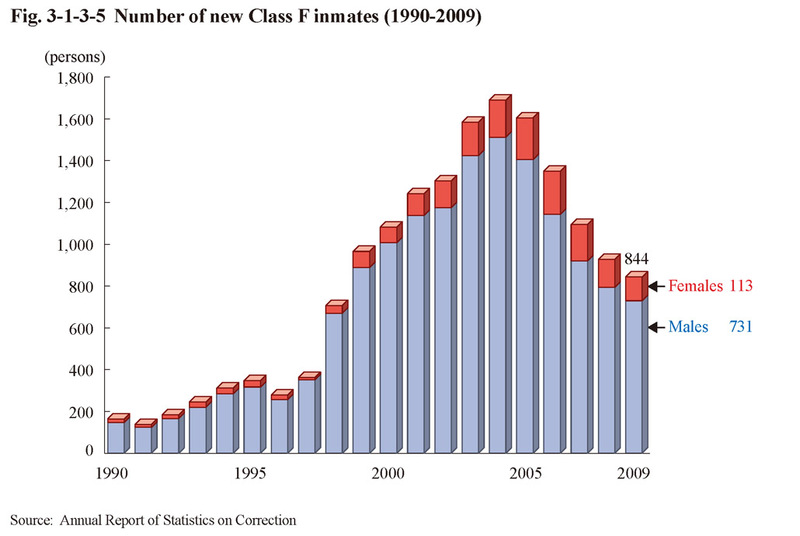 3-1-3-5 shows the number of new Class F inmates over the last 20 years. The number started to increase sharply in 1998 and reached 1,690 in 2004, but then continued to decrease every year from 2005, and was 844 in 2009. By nationality, etc. of new Class F inmates in 2009, 291 were from China, the largest in number, followed by 107 from Brazil, 89 from Iran, 71 from South/North Korea, and 58 from Vietnam (See Appendix 3-5). By type of offense, theft was the largest in number at 271 persons, followed by Stimulants Control Act violations at 180, Immigration Control Act violations at 115, robbery at 69, and Road Traffic Act violations at 28 (Source: Annual Report of Statistics on Correction). 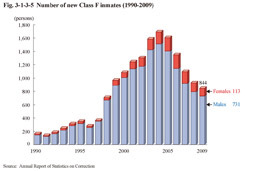 As of the end of 2009, the number of Class F inmates was 2,976 (2,722 males and 254 females), a 7.9% decrease from the end of the previous year (Source: Annual Report of Statistics on Correction).